GIVEN THE CHOICE between having a very good fly line and an average rod, or a very good rod and an average line, nearly all experts would choose to have the better line. And for good reason. The line is what actually carries the fly to the target and delivers it. It’s easy to adjust your casting stroke to accommodate differences in fly rods, but if your line won’t shoot through the guides, or float or sink as it should, or carry the fly properly, you’re going to have a long, frustrating day on the water. So, how do you know what is the right fly line for the fishing you do? Typically, four factors determine which fly line is the right choice: fly size, the species and size of fish you are fishing for, fishing conditions, and your skill as a caster. In most cases, the first thing you need to do when choosing a fly line is to consider the flies you will be casting. (In reality, that should be an important part of choosing your rod also.) It’s the mass of the fly line that will carry the fly, so if you will be throwing big, heavy or wind resistant flies, you will need enough power in the line to carry them. If your line doesn’t have enough “power” (in real terms, mass) to carry the fly through the air, casting will be difficult at best, and certainly not much fun. Fly lines are rated by weight. The higher the line number, the heavier the line and the better it will cast large flies. Very light lines, of say 0- to 4-weight, are suitable for small trout or panfish flies, typically up to about size 12 hooks (remember: the larger the hook size number, the smaller the hook). 5-6-weight lines are the most commonly used sizes for trout and panfish and work well with flies on hooks up to about size 8. A fly line’s taper, which I will describe later, can expand that range some. Line weights 7-9 are most commonly used for fish such as bonefish, bass, steelhead, stripers and other mid-size fish and with flies up to about size 1/0. Lines 10-weight and heavier are reserved for big fish, and often big flies. The rods that match these lines are stiff and powerful and are capable of throwing these heavy lines long distances, and they carry big flies well. Although fly size is the first thing to consider when deciding what weight rig you should have, the fish you plan to pursue can have a big impact on your choice. A good example would be tarpon. Tarpon flies are typically not very big or hard to cast — most could be easily cast with a 7- or 8-weight rod and line. But landing a one-hundred-pound tarpon on one of those medium-sized rods would be a challenge, so a much stiffer rod is normally used. Others examples are warmwater species like pike, muskie, or largemouth bass. While most bass can be easily landed on a 6-weight rod, the flies anglers cast for bass are often very large and wind-resistant. An 8- or 9-weight rod takes the work out of the casting without being truly out of scale with the fish. Night fishing for trout is another unique example. In this case “overlining” — using a fly line that is heavier than rated for a rod — offers distinct advantages. Typically night fishing is done at close range and with big flies. Since casting distance is short you’ll typically fish with less line outside of the rod tip. Going up a line size, or even two, can help the rod load in close and can also help turn over the big flies. Sometimes the fish and fly size will indicate a certain line weight, but conditions where the line will be fished will play a large role in choosing size. For example, bonefish flies are typically small and light, and the fish are not usually very big. 5- or 6-weight rods and lines are certainly adequate for most bonefishing, but conditions are often require anglers to cast across or even into the wind. The heavier mass of a 7-, 8-, or 9-weight line makes the wind less of a challenge. Wind also means that many of your casts will be shorter. Lines designed for shorter, faster casts — especially in saltwater — typically feature a shorter “head,” compacting most of the line’s weight into the front of the fly line. These lines typically also have a front taper designed to ensure good fly turnover and delivery. Many of these lines are made to be slightly over-weight for their given rating, another feature that speeds rod loading and delivery. If you don’t have access to one of these specialty lines and plan to fish in tough conditions, a good alternative can be to fish with a line one size higher than your rod. The other climactic condition that should influence your line choice is temperature. 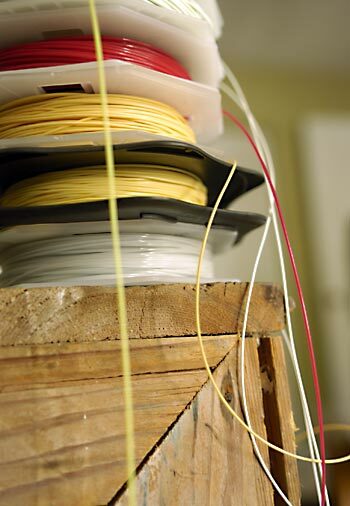 In very hot, tropical weather, plastic-coated (PVC) lines can become quite soft — causing them to tangle more — and limp, causing them to not shoot well. 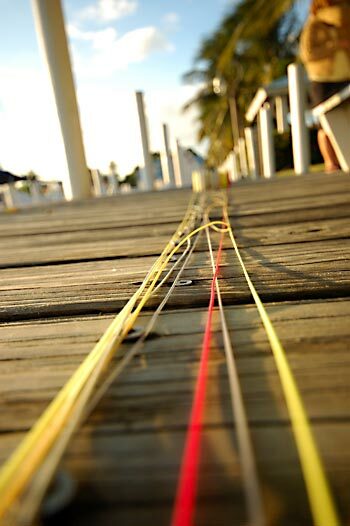 Many lines are designed specifically for tropical heat, with harder coatings and stiffer cores that perform best in the temperature ranges found on bonefish, tarpon, or permit flats. On the other hand, these same lines become stiff and wiry when weather is cold, so don’t make the mistake, for example, of trying to use a specialty bonefish line while fishing for stripers in cold weather. More often than not, you’ll be well served by considering the distance that you plan to cast when choosing a line. Most fly line packaging will tell you the length of the various sections of the fly line and other information, such as whether the front and rear tapers are gradual or more extreme. Pay attention to the length of the head — the front taper, belly, and rear taper combined — where most of the weight of the line is concentrated. Your first goal is to match the line’s head length to your typical fishing distances. For short casts and the kinds of conditions in which most of us learn to fly fish, the lines head length isn’t all that important because it will rarely be out of the rod anyway. Double Taper (DT) lines work well at short range. At short range, little hauling or shooting of line is done, so how the front taper delivers your fly is the most important thing to consider, whether the line be WF (“Weight Forward”) or DT. However, few of us have the luxury of knowing that all of our casts will be short, so head-length decisions should be made based on the other casts that will be made. For casting at moderate distances, WF lines with longer heads and lines like the classic “double-taper” work well in most situations. WF lines with short- to medium-length heads are good because they can be carried to a comfortable distance and then shot to the target. This saves time and false casting. DT lines work fine too, but they don’t shoot as well, so the caster needs to be skilled enough to carry more line in the air. In some fishing applications, like stream fishing for trout, line control is very important. WF lines with short heads don’t allow line control beyond short ranges, so go with a DT line, or WF line with longer head. For fishing that requires longer casts, your casting skill will largely determine what line design will work best. If your skills are average, a line with a short- to medium-length head will work best. If you are a skilled caster who can carry a lot of line in the air, using a line with a long head will enable you to throw farther. There is a downside to lines with long heads though: they take longer to cast. More false casting is required which means the delivery cast will be delayed by a false cast or two. If your application is one that often requires quick casts (e.g. tarpon or permit), choose a line with a short head regardless of your casting skill. For lots of different reasons, fly fishers often end up using rods and lines that aren’t well matched to their skill levels. Very stiff or “fast-action” rods tend to get more marketing play these days, and they’re great for experts wanting to cast long distances but typically a poor choice for casters who don’t have excellent timing. The same holds true for fly lines. There are a number of lines on the market that are designed for expert casters and for advanced techniques that are required to fish specific conditions. Long-distance casters might search out very long heads to which they will attach a running line, but lines built for extremely long casts may make medium-length casts more difficult. An expert with bamboo rods might want a very fine taper, but lines that can provide pinpoint accuracy at short range for an expert angler might make loading the rod a challenge for the novice fly fisher. There are over 2,000 unique fly lines available to today’s fly fishers — enough to match any situation and casting style. Just keep in mind that novice anglers often won’t usually benefit from highly specialized line designs. Finally, here are a couple of scenarios that show how you can use the basic guidelines above to make a good line choice. Example #1: An intermediate angler is making his first trip to the Bahamas to fish for bonefish. The recommended bonefish flies for this trip are sizes 4 through 8, so any line over a 6-weight would suite his needs, but an 8-weight line would make casting easier in strong winds. The likelihood of lots of mid-range and shorter casts dictates that he has a line that will cast well without a lot of line outside the rod tip. And hot weather demands a line with a stiffer core and/or coating. This information should lead the angler to purchase a line designed for tropical use, with a head length that is relatively short. Most manufacturers make at least a couple of versions of lines suitable for bonefishing — often one with a rather long head and one with a shorter head. As an average caster, this angler would most likely struggle using the line with the longer head and would be much more successful with the shorter head line. Lastly, since almost all bonefishing is done with floating lines, the best choice for this angler would be a weight-forward, floating, 8-weight line. Example #2: A beginning angler lives in the east and wants to fish smaller streams for small trout. While small streams and small trout usually mean small- and medium-sized flies that can easily be cast with a light 2- or 3-weight line, very small lines can be more difficult to cast than heavier lines. Most beginners will do better with a 4-, 5- or even 6-weight line, even though the fly sizes don’t demand it. Since casting distance is short, the line can be either double-taper or weight-forward; it makes no significant difference since there won’t be much line out of the rod tip during the cast. Although an experienced angler would probably pick a line with a very delicate front taper, a beginner will have a hard time making it work, because delicate tapers require good casting loops to work effectively. In this case a 4- or 5-weight, double-taper line with moderate taper would be the best choice. Example #3: An expert caster wants to go the Oregon to swing dry flies for steelhead. West coast steelheading, especially when swinging dry flies, often requires long casts and long-range line and fly control. For long-range casting, and for lots of pick-ups, mends, and roll-casts, a line with a very long head is required, as there must be line mass at the rod tip to allow long range line control. The right line for this application, and caster, will be a line with a very long head — 60-plus feet. To make this all work though, the caster must be quite skilled. In the hands of someone who is not capable of casting long distances, a line with a shorter head would be better.